Lilyfield Farm is located in west central Saskatchewan, Canada. Our garden location is considered zone 3. All plants are field grown, have survived and thrived here for several years. We sell only varieties that are excellent performers in our climate. The harsh winters kill off the less hardy. Plants the have poor foliage, few blooms or ugly, non-opening blooms are composted. We try them, so you don’t have to. We ship blooming size bulbs and fans, not the tiny fans and bulbs you will receive from the larger bulb companies. Lilyfield Farm ships via Canada Post. 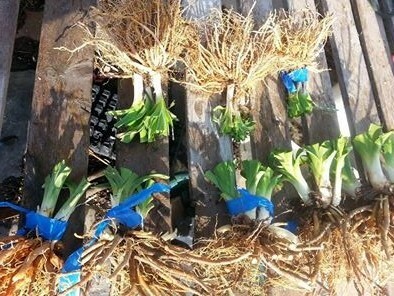 Daylily roots ship in spring, double fans, bareroot. Lily bulbs ship in fall. We do our best to have an accurate listing, the inventory automatically updates. If we cannot fulfill an order, the money will be refunded. Cheques are payable to Cheryl Siemens. We will reserve your plants for two weeks pending arrival of your payment by cheque. We also accept Paypal and credit cards through the Paypal Checkout. We dig your daylilies, wash the plants with plain water, trim the foliage and roots to relieve a bit of replanting stress, wrap them in paper with a label and ship them within that day or the next. Planting instructions are included in the box. One thing to keep in mind that if the plants are in the mail to for a week, they will likely yellow and die back a bit. 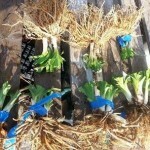 Wait it out, if they are cared for and watered they should bounce back with new healthy foliage. We guarantee the daylilies to live through their first winter in zones 2-7. WILL THEY BLOOM THE YEAR THEY ARE PLANTED? The experience here is that the shorter time they are out of the ground, the more likely they are to bloom the first year. When plants arrive at Lilyfield that have been in the mail for a week, about 40% of them bloom that same year. The larger, and healthier the fan, the less stress, the more likely they are to bloom the first year. We would appreciate your feedback on how they do their first year. 28″ This plant is 28 inches tall from the base to the top of the scape (flower stalk). Tet or Dip Daylilies are classified as tetraploids and diploids. It is the chromosome count. There are plants that are somewhere in between. Useful for hybridizing. Tetraploids generally have thicker scapes and foliage. 5″ The flower size, measured across the face. DOR,SEV,EV Denotes the type of foliage, Dormant, semi-evergreen, evergreen. Dormants and many semi-evergreens do well here. Not to many evergreens thrive in this climate. EE,E, EM denotes early bloom season. M means it blooms mostly mid-season, ML, L means later bloom season. Ext means extended bloom, flowers remain open for more than 16 hours. Noc means flowers start blooming in the evening. Diu, most daylilies fall into this category. Day-blooming. RE Rebloom. To be truthful, most daylilies that say RE, do not rebloom at Lilyfield. They rebloom in the climate that they were hybridized in, for example Florida or Tennessee. If they rebloom at Lilyfield, we make a note of it in the written description. Some that do rebloom here, are often from breeders closer to our climate.